Our first board (the Blue Horse) is currently out of stock. Check the Latest News link above for updates on our latest advances. Use the Contact link above to sign up to be informed when the next products are available. These links and the info below is relevant to our first product. 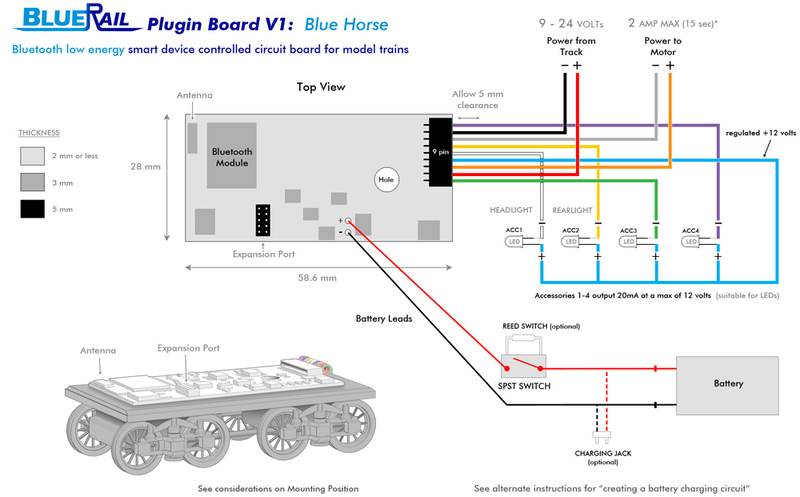 This first bluetooth control board was nicknamed the Blue Horse. It measures 28mm x 58.6mm, features a 9-pin JST connection port, and can be used to drive any train with a DC can motor (not exceeding 2 amps*). The boards can be easily plugged into any DCC-ready train, or wired directly to many non-DCC-ready locomotives. These boards are of particular interest to battery operated users (as they can run from either track or battery power). You will have control over speed, direction and up to 4 lights or accessories. The boards also contain an expansion port for future add-ons (sound). BlueRail boards may alternately be used to control up to 4 lights or accessories on your layout. Control your board using the configurable BlueRail app (see below regarding iOS/Android app) or the Bachmann E-Z App™. Please use the information below to decide if this first board is suitable for your needs. We will release subsequent boards in alternate dimensions and suitable for other gauges in the future. Space: Use the dimensions of the board (28 mm x 58.6 mm x 5 mm) to make sure it will fit. Allow an extra 5 mm to the length of the board (58.6 mm + 5 mm) to allow for the wiring harness. If possible, allow for 5 mm vertical clearance above the expansion port for future connectivity. 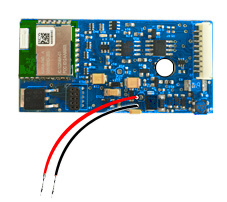 This board can either plug into a DCC-ready locomotive using a wiring harness, or may be used as a complete drop-in board (using a 9-pin connector to NMRA colored wires). Please refer to the colored wiring in the diagram above for proper connections. Power: It is very important to test the stall current of your locomotive and that it does not exceed 2 amps*. Attempting to draw 2 amps or more from the board for more than 15 seconds will cause the board to shut down. Please refer to the chart below for details. Also see instructions on “testing motor stall current”. Do not use AC voltage to power the board. The board will operate on DC voltage between 9-24 volts. Do not use the board with O gauge Universal motors. Do not use old “Pulse Power” transformers to power this board. 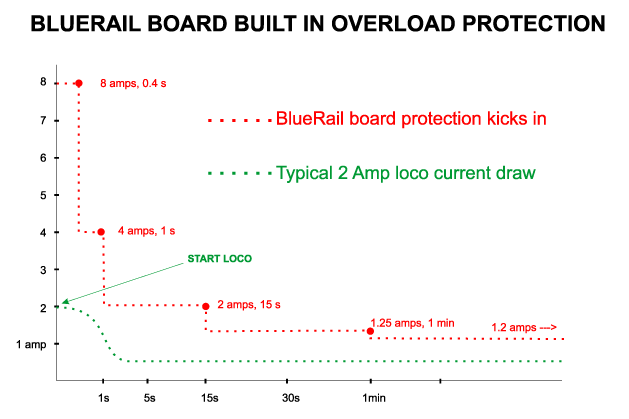 * Overload Protection: The BlueRail board contains circuitry to protect itself in the event of a current draw overload. Please refer to the graph. The red line indicates the point at which the BlueRail board shuts itself off. The board will tolerate an 8 amp draw for .4 sec (before shutting itself off). It will tolerate a 4 amp draw for 1 second, a 2 amp draw for 15 sec (continuous), a 1.25 amp draw for 1 min (continuous) and a 1.2 amp draw continuously. A locomotive with a 2 amp stall current (green line) will typically draw 2 amps of current for the first few seconds it starts to roll, before stabilizing at a much lower current draw. Pulling heavy loads up steep long hills and lots of lighting will increase current draw. Please consider these values when deciding if this board is appropriate for your locomotive and layout. Electrical: If your locomotive is not DCC-ready (and you are modifying a standard locomotive) it is important to isolate the motor and lights from the frame. Failure to do so may damage the board (or result in the train not running). See instructions on “isolating motor and lights from the frame”. Always handle the board carefully in a static-free environment. Make sure the board is electrically isolated from all metal surfaces or circuitry in your locomotive. In our experience, an improperly isolated motor results in the motor stopping the moment the train starts moving. Mounting Position: To achieve maximum range, orient the board with the circuitry facing upward and the antenna as far from metal chassis areas as is reasonably possible. Mounting the board vertically is ok, but may result in slightly less range on the bottom (no circuitry) side of the board. 8-pin Connections: If you are using an 8-pin connector to your locomotive, make sure to plug it in with the proper orientation on your loco. (Failure to do so will result in your loco running backwards). See instructions on “using 8-pin connectors”. 8 pin connectors do not take advantage of ACC3 and ACC4 from the board. If you choose to utilize the green (ACC3) and violet (ACC4) wires, refer to the wiring diagram. Battery Use: The board contains two connection points to which wires may be attached as battery leads. If you are not experienced with soldering small connections, please consider purchasing a board with the wires already soldered in place. Improper soldering can result in damage to the board. 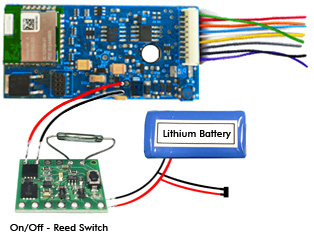 If you plan on connecting battery wires to the board connection points, we strongly encourage you to purchase a board with the 2 wires already soldered (for just $10 more). The two connection holes are 1mm large separated by 1mm of space on the board and can be very easily bridged with solder if not done properly. The board will operate on track power or battery power. You may use both at the same time (for improved performance on dirty track). When using battery, make sure the battery polarity is correct. For smoothest transitions (from powered to non-powered sections of track) your battery voltage and track voltage should approximately match. The board is not capable of charging batteries. See instructions and options for charging batteries in the article “Battery Powered Trains”. 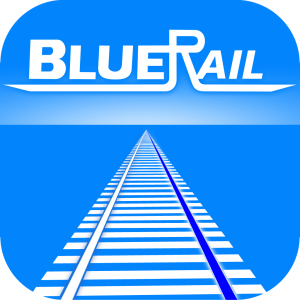 iOS app: The free BlueRail iOS app is available in appstore. These boards may also be operated using the Bachmann E-Z App™ (now available in the iOS appstore). The BlueRail app includes additional configuration and customization options. For details on the BlueRail app, please see our Userguide. Android app: The BlueRail Android “Beta” is now available in the Google Play store. “Beta” means this is a preliminary but functional version of the app, which will be updated to full functionality over the next few weeks. Please reference our Latest News Page for details on Android app progress.